We had a fun day of hanging out at Dockweiler today. The NWS forecast was 21 to 25mph. Their forecasts are often a little on the high side ... but not today. The sand was blowing hard until the front came through with a light shower and a rainbow. We made the best of the time with planning of future events and flying various kites and creative flying toys (provided by Joe Faust). It was a fun day of almost flying. Back to Dockweiler for the third consecutive day today (Tuesday). Joe Faust was there and had already made 10 flights in his Alpha by the time I arrived about 12:15pm. The wind was straight in at about 10 or 11 mph in sharp contrast to Monday's screaming, sand throwing, hurricane. We flat set up my 330 for the first time. 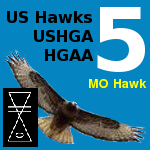 I had watched Windsports do that on Sunday and decided to try it for both set up and take down. We both decided we liked that method as opposed to setting the glider up on its control bar. I used the base tube wheels to wheel the glider to and from my truck by strapping the base tube, with wheels attached, across the glider bundle near one end. It worked great! I had three very good launches and stand up landings. I also took the first flight on my 330 after set up, which was a first for me. I had in the past let Bob or Joe take the first flight. I had planned to leave early today anyway and about 3 pm when the wind went more NW I decided it was time to pack it in and go sit on the 405 for 2 hours. Joe was still making flights as I drove away. You guys are an inspiration to pilots everywhere!! Sunday Dockweiler: Frank flight stand up and then to wheels because of stumble or letting wing just get ahead of him. Josh helped a fast return. Monday: 26 mph+ blow out, but great commardie in Frank's truck and with Angela's sent chips. Eight kites were flown. One sweet experiment fulfilled: Loop tether control of arch with tumbling wing: Two spread pullies held the base part of the large loop tether. The lifting rotating wing was generally centered in the high aerial part of the arching loop tether. Let go of the loop tether and all was in balance. Any would arrive to the near-ground part of the loop tether and grag that part of the loop tether; then move a point of the loop tether to the left (looking at wing) and the the wing above would move to the right; move the point of the loop tether to the right and get the wing sliding to the left. To do: put a bull wheel in the lower line of the loop; then turning the bull wheel would give a direction natural to car driving or airplane flying; facing the wing: rotate the bull wheel counterclockwise and the wing would slide left; rotate clockwise to get wing sliding right. I envision school kids walking up to the lower line and moving the line left and right to see what change they bring in the wing's position. Wind force broke main left tether of a kiteboarding trainer parafoil. Special "I'm a Bird" wing kited by Joe and then bob and then: rain on backs, super weather cell above, white caps, sun streaming into virga: gave rainbow frame to the kite's wing .... special weather and scene and great closing of the day. Our FDGS prez is fast approaching his 83rd BD in March. On Monday https://en.wikipedia.org/wiki/Bob_Bendetson Bob Bendetson showed at Frank's truck while BobK, JoeF, and FrankC were discussing many things. 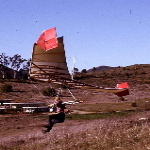 Bendetson answered two of my questions: he is now with over 18,000+ flights in a HG at Dockweiler; and his day-most record is 66 flights; that might be a world-record for self-returned hang glider flights in one day; he had been aiming for 100, but his legs gave out at 66. I mispoke on Bob Bendetson's involvement with The Simpsons; see the facts in the wiki on Bob B.
Frank had 3 great flights; see his report above in this diary thread. Frank's stringed pin to keep nut in place at basebar ends (nice and easy, yet provides a hand-skin catch that might invite a change yet). [ ] Make a checklist for Alpha assembly and disassembly. My tiredness in dark after sunset did not permit me to solve the frustrating kingpost not wanting to stay in its folded position during disassembly even after about 10 tries while the wind was howling and flapping the sail. While at the end of 8 hours of flying with over 30 flights, and while it is dark, and while the wind was over 15 mph, mistakes were made; reasoning ability suffered. Have a laminated card for reading during packing procedure. Step-by-step. Perhaps affix a copy on the main packing bag. I woke from sleep on day after with a clear vision of my error regarding the kingpost not staying in its down position: I forgot to unhook the set of reflex lines from the kingpost! The stayed hooking prevented proper storage of the sail. The time cost in the dark very-windy cold air was about 30 minutes extra for that unresolved error. [ ] Alpha fell flat during a disassembly procedural error on Feb. 20, 2018; [ ] I must fully inspect spar and cross spar bolts; did the error bring damage? Manual: not flat assembly. [ ] Repack the Alpha as it is now packed poorly as the reflex lines are still attached to the apex of the kingpost causing poor sail packing. [ ] Epoxy a ring on the TCF bolt that holds the basebar; then to the ring have a string for non-loss of the bolt. [ ] For the basebar nut: drill hole and place a string; accept string twist as the string will untwist once the nut is free. [ ] Use a safety pin (softer on hands ... for the replacement of the circular wire. Anchor a string to the safety pin. [ ] Permanently cord tie the rain cover on the passenger side along full length. Thus keep the rain cover immediately ready for pulling over the tope of the hang glider. [ ] Loose tip bags, control-bar bag: these billow and roll away in heavy winds. How to handle these so the bags are available and unable to be lost or blow away? What if each were clipped to the main large packing bag? Unclip each untility bag exactly when the bag is wanted. Or perhaps clip the bags to my belt. And write on the bags the purpose. Flights: Startng after rigging the wing at about 11:00 a.m: 10 flights non-stop on the Alpha 210. Then 5 more after a rest. Then 4 flights on Frank's Condor 330. Then easily 20 more. Total over 30 flights. Last flight was while the setting sun was half-disk at sunsetting time. The wind kept getting strong after Frank left at about 3:45 p.m.
Frank saw one long flight just before he left. After he left the wind grew strong and was turning north off of ideal. But some soaring was occurring; many full bluff runs with turn outs. One full figure 8 using full front west bluff. No crashes. Many touch-and-continue flights. Many hooked-in-walk-backwards up return slope with immediate kiting of the wing ready for free flight at any moment. Watch airspeed and near-slope wing tip! Communicate with sunset photographers, as they like the bluff. Three flights were long-ridge travel and all the way back. Wing inspection did not reveal any bending or damage. 10 a.m. to 5:30 p.m. flying period. Just like an Olympian - when he learned that Bob Bendetson had made 66 flights some years ago, Joe, the Olympian high jumper of yore, had to take the challenge. Well, you got the silver this time but I'm betting you will get the gold next time, Joe. Thanks. A concerted effort will be made after some training. And there will be photos of each flight launch with a number showing in the still photo. A collage will be assembled with the 67 or more flights. The flight must be from the top of the bluff with a landing in the LZ. Touch-and-goes will count as just one flight. The wing must be carried back by the pilot. Tuesday, today: Softer lower wind today. Alpha 210: 23 flights. Full-weight carrybacks; the wind simply did not help. Tired from yesterday; all motions were begging for a day of rest or two or three days of rest; but our deal is Monday and Tuesday. Today: Left home at 8:08 a.m. and returned home at 8:15 p.m. Ate breakfast on drive to Dockweiler. Met Vernon: he brought water to me; he saw the struggle. "Keep on keeping on!" he said. Non-hang glider guy, but he will look up things HG now. Met model flyer that shows frequently. Met (think I have it:) Mark Miller who visited one of the Otto meets. His HG start was in 1975 with an Eipper Flexi. Then he went to Seagull III. No current harness. He warned me that I could be ticketed for flying when school is closed; I told him of the opportunity for him: B&H Waiver. He might go and sign. Met Robert, elementary school teacher; I answered his questions. Many people took pics of the HG today. Flew four kinds of kites. Continued experiment with wide-based loop arch kiting; dreaming of HG lift by arch. An inclined ramp might be fun at Dockweiler. Great cloud watching today! Ah! AWE! Special weather with enjoyable clouds, sprinkles, and rain. Fellow in wheelchair not giving his name yet shook hands and bumped fists with an exclamation that he was responsible for digging some of the holes to set anchors for the hang glider tie downs decades ago; I am betting I'll see him again. One miniature kite flown; then wind died to near zero when it was supposed to be about 10 mph. With rain and calm: big wing never came off the rack. Went for lunch and returned to still calm. Left site at 6 p.m.
Had a good restful pleasant beach-side session. Seven times up and down bluff and some walks. Meditation, prayer, and soaking-in the horizon. JoeF wrote: Meditation, prayer, and soaking-in the horizon. You're a continual inspiration to me Joe. Thanks.